Skyline Aviation Software - Airline Information Management the Way it Should Be. Choose a product from the list on the left to learn more. The Skyline system is a user friendly in-house reservation system that offers both functionality and flexibilty. Skyline offers a comprehensive Charter Quote and Invoicing System that integrates well with the other Skyline programs. The Skyline Statistics module is a powerful planning and analysis tool. Within Skyline, an application exists that assists users in balancing their daily ticket, cargo and charter sales, with their cash and charge receipts. Skyline offers clients a very powerful tool to manage all aspect of their cargo operations. Skyline offers up-to-the-minute flight data in an easy format, to help increase aircraft utilization. Skyline Project Management provides a wide array of collaboration tools so that your employees can complete tasks more efficiently. Skyline offers the ability to make reservations using Internet Explorer by the general public. Skyline Safety Management System (SMS) supports various safety problems submission, risk management, risk-project creation and management, and reporting. Skyline SMS reporting tool generates statistical reports for the Safety Management System (SMS). Skyline Cargo Tracking System effectively track your cargo in real time, and also print labels for cargo labelling using industrial printers. Skyline is capable of processing all types of credit cards including; VISA, MasterCard, American Express, Discover Card, JCB, Enroute, Diner's Club and Pin Debit as well as gift cards, loyalty cards, cheques, phone cards and more. 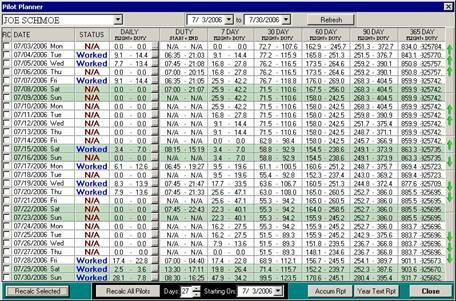 Skyline Accumulator is used to track flight crewï¿½s flight and duty times. This includes Daily-7-30- 60-90-365 day times, as well as Duty Start/Duty End times. If you register with us as a contact, you can view your previous bookings and your credit statement Online! You can customize which information you want your customers to provide when booking, such as E-Mail, Phone, Fax, or Cell. Your Online Contacts can be set up to have a shortcut on their desktop directly to book on your site, with or without validation. The Skyline Accumulator is used to track flight crewï¿½s flight and duty times. This includes Daily-7-30-60- 90-365 day times, as well as Duty Start/Duty End times. Skyline has a program in place called the Accumulator is which designed to track the flight and duty time of all crew members in an individual basis. More than just tracking, the Accumulator enforces CARs (Canadian Aviation Regulations) restrictions by notifying any users attempting to place a pilot on a flight which could exceed one or more of the many regulations which govern duty time. This system is designed to prevent any issues which would allow a user or airline to unknowingly exceed those regulations set out by Transport Canada. Flight Information This screen displays each flight leg for a flight crew member on a specific day.